We’re glad you’re considering a tax preparation professional in Aurora. It can be worrisome and sometimes even daunting to file your own income taxes every year. Our clients found Five Star Multiple Services because they were worried they didn’t file correctly, scared of making a mistake so they didn’t file, or they owed money to the government because of a filling mistake. Does this sound like you at all? You’re not alone. Before you search “tax preparation near me” or “tax help near me” review the following list of questions we recommend asking your tax professional before hiring them. Do you give a free consultation? You want to know what exactly you’re receiving and at what cost. This is a commonly missed question, either because clients assume consultations are free, or they don’t think to ask it. Make sure and ask this question before you move forward with any paperwork. Do you participate in continuing tax law education? You’re hiring someone else to take care of your taxes for you. You want them to be knowledgeable and educated in tax law, updates, and changes so you can benefit from their expertise. Do you have professional credentials? Not all tax professionals have credentials; however, you still want to ask this question to ensure you’re hiring someone who knows what they’re doing when it comes to your taxes. Listen for which credentials they do have and go research them. In many cases, acquired credentials mean taking courses and passing exams to prove knowledge and application of that knowledge. You want to find someone who has good credentials and a history of experience. This is a simple business question. The longer someone has been around, the more likely they know what they’re doing. This isn’t a foolproof question, but it does give you an idea of how much experience the tax professional you’re looking to hire has actually gained over the years. Who will be working on my taxes and what are their credentials? In some cases, you’ll speak to one person in your consultation, and that person’s team will work on your taxes. It’s completely fair to ask who will be working on your taxes and what that person’s credentials are in relation to tax preparation and filling. Remember, filing taxes is about your money, so manage it. A tax professional who is insured and bonded not only protects them, but it also protects you. Verifying their policy and their coverage separates scammers from the true professionals. Do you represent me if I get audited? What if the IRS decides to audit you? 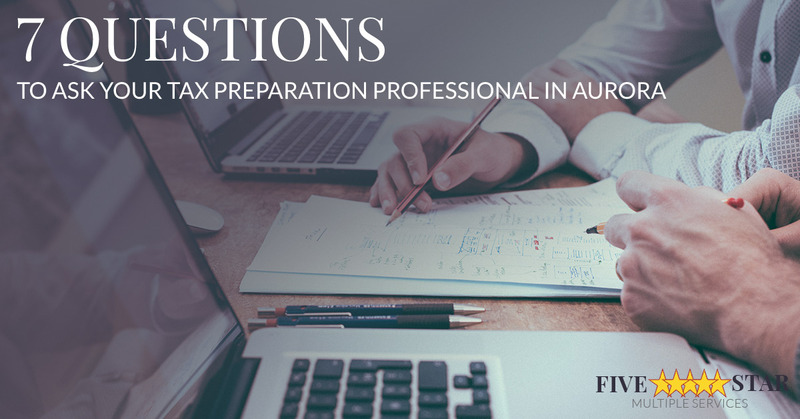 It’s important to understand whether or not the tax professional will be assisting you through the audit or if they simply prepare and file the taxes. Request how much the audit fees will cost for your tax preparation professional to walk you through the process. It may cost more, but if you don’t successfully navigate an audit, you may be paying in more than the professional’s fees. Before you decided which tax preparation professional to hire, give us a call and ask us the questions above or anything you can think of. We’ve been serving Aurora for years and want to help you with your taxes.